Duke BME faculty members are engaged in a wide range of efforts to improve human health through research–from creating the world's first real-time, three-dimensional ultrasound diagnostic system to developing the first engineered blood vessels. 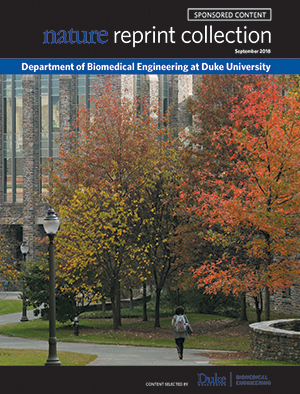 The department's close proximity to the Duke University Medical Center has fostered a highly interdisciplinary approach to research, with engineers working closely with both biological scientists and physicians–collaborations enhanced by our innovative Duke-Coulter Translational Medicine Partnership and Duke MEDx programs. This breadth of expertise is reflected in all our research programs, as we work to translate fundamental advances across the molecular, cellular, and organ scales into new developments for improved diagnosis and treatment of disease. See a list of recent notable research by our faculty, published in selected leading journals. Both undergraduate and graduate students conduct research in these areas under the guidance of Duke BME faculty researchers, who include many winners of prestigious scientific awards and fellows of respected societies. In one of the clearest hallmarks of faculty excellence, sponsored research at Duke BME from both federal and non-federal sources has grown more than 60 percent over the past five years. Research in Bioelectric Engineering at Duke spans a range of length scales from the ion-channel to the organ level. One of the main areas of focus is the development of realistic mathematical and computer models of cardiac muscle. Ongoing interests include the molecular design of soft materials, nanomaterials, immune-active materials, scaffolds for tissue engineering, and basic investigations into the complex mechanisms by which materials engage biology. Efforts range from applications in orthopaedics, injury mechanics, biomaterial and tissue engineering design to those aimed at affecting disease states where mechanical perturbations in tissues are known to augment pathogenesis, such as cancer and atherosclerosis. Our researchers are developing innovative data science, machine learning, and digital health modeling approaches to transform multi-scale biomedical data into actionable insights. Our research efforts span from advancing the physics and mathematical theory of imaging, image acquisition, and image processing to hardware design and clinical applications. Research in the fields of biosensors and bioinstrumentation utilizes recent advances in biochemistry, electronics, omics (genomics, epigenetics, proteomics), and physiology to develop novel diagnostic, therapeutic, and prosthetic devices. This quantitative research uses modeling and simulation, high-performance computing, and large-scale data analysis to create testable hypotheses about mechanisms driving complex biological function. Duke BME is actively involved in understanding and developing new strategies for drug and gene delivery aimed at therapies for cancer, infectious and cardiovascular disease, muscle disease, gastrointestinal disease, and others. Work in this research area includes the design of novel vaccines and technologies for treating wounds, chronic inflammation, cancer, and for tissue engineering. We conduct research on novel neural technologies that can interact with the brain on a much finer scale and with greater coverage than previously possible, using both electrical and optical measurements. Research in this area includes development of new strategies for regenerative medicine, treatment of genetic disease, and techniques to establish robust gene circuit function. Technologies under investigation range from biomaterial/cell constructs for repairing various tissues and organs, to stem cell therapies, to immune therapies.